Dave LaBelle began his photojournalism career at the Ventura County (California) Star-Free Press as a weekend sports shooter and lab man while still in high school. During his 35-year career, LaBelle has worked for 20 newspapers and magazines in nine states, including the Anchorage Times, San Bernardino Sun-Telegram, The Chanute Tribune, Ogden Standard-Examiner, The Sacramento Bee and the Pittsburgh Post-Gazette, where he was assistant managing editor for photography. LaBelle’s love for feature photography and his ability to hunt out feature ideas has helped him win numerous awards. At 19, he was the National Press Photographers Association Region 10 Photographer of the Year, an honor he repeated the next two years. He was runner-up to W. Eugene Smith for the first Nikon World Understanding award in 1974 and runner-up for the NPPA National Photographer of the Year award in 1979. In 2002, the Photographic Society of America Inc. honored LaBelle with the International Understanding Through Photography award. The award’s judges said, “LaBelle’s background and accomplishments in photography have contributed to greater understanding among people everywhere.” LaBelle joined the faculty at Western Kentucky University in 1986 and taught photojournalism for more than a decade. In 1989 while at Western, LaBelle published the first edition of “The Great Picture Hunt.” LaBelle is also the author of the book “Lessons in Death and Life,” which was published in 1992 and deals with the ethics of photographing grief. In 1991, the NPPA honored LaBelle with the Robin F. Garland Award for photojournalism education. LaBelle now resides back in his hometown of Oak View, Calif., where he is living with his family, writing books and teaching classes in photography. Comments | [01/22/11] Dave LaBelle's books are about simplicity. 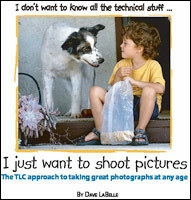 Whether it be the pursuit of storytelling photos in "The Great Picture Hunt" or the learning the fundamentals of photography as seen in "I just want to shoot pictures..." LaBelle breaks down the complicated world of photography to its' basic elements and he makes it fun. As a student in Dave's basic photography class at Western Kentucky University, I went into the class with prior experience in photography, but Dave created a class and assignments that challenged us to be good and made it fun to learn. I believe his latest book, "I just want to shoot pictures..." would be an excellent book to give to friends and relatives who are interested in learning about the fundamentals of digital photography in a fun and simple way. I think it would be an excellent text for teachers at the high school and college level who are searching for a book to use as an introductory text.